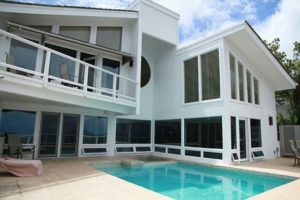 Bring in the Beauty with Oahu's ultimate replacement window and door company.Windows Hawaii is the exclusive distributor of Anlin's Ali'I Extreme line; a line of windows and doors designed specifically for Hawaii's tropical climate. Windows Hawaii delivers the quality you demand by providing only the highest grade windows, window materials and service. New window installation adds beauty and value to your home. Choose Window Hawaii's vinyl replacement windows and you'll combine the energy efficiency and low maintenance of vinyl windows with the charmed, crafted look reminiscent of wood-framed windows. We offer replacement window installation for the entire island of Oahu. Replacement windows add value to your home, making it look years younger and allowing it to operate more efficiently. If you have old cracking and corroded aluminum or wood, vinyl windows are your solution for beauty and energy efficiency. They can even be customizable if you are seeking a whole new look or function for a window space. Replacing windows takes years off of the appearance of your home. Replacement windows installed by Northwest Exteriors have the color blended right into the vinyl for a lasting finish that's easy to maintain and never needs painting. Windows replacement improves home energy efficiency, saving you money on your monthly energy bill. You'll keep the noise out and the comfort in, too. Our windows are engineered to reduce exterior noise, making your home a quieter, more comfortable place to live. Replace windows with new designs that are easy to clean and operate so you can easily let the breezes in, or lock them shut to keep the elements out. Vinyl replacement windows installed by Northwest will never rot, peel, or flake like wood windows. Nor will they ever corrode, rust or pit with age like metal windows. Windows Hawaii offers the highest quality materials, expert craftsmanship and installation, and a limited lifetime installation warranty. Plus, make sure to ask about our "Competitive Pricing Guarantee!" We install window replacements on the entire island of Oahu.